A multi user email client consisting of features like efficient SPAM filtering, customizable email filters; Sorting of read/unread messages etc. 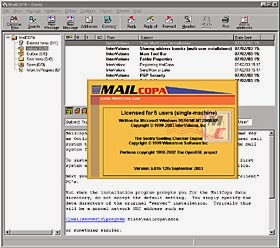 MailCopa was the first ever multi user e-mail software to allow n number of connected computers to access a single mail profile. Technical support, help desk or wherever more than one user was needed to access the same email at the same time had a great time utilizing this email client. Aimed for flexible and powerful mail experience. It is equipped with unique features such as: flag pointers for sorting read / unread emails. It serves IT solutions such as technical support departments, help desks; due to its unique feature of multiuser access to a single mail account. Shared View: Provides option for private/public email access exclusively to multiple users using a single mail account. The shared content is made visible to all the group members, but the private content is kept well protected. User gets to enjoy the freedom of using multiple digital signatures and replying to different email addresses separately. Text To Speech: It has an inbuilt feature of reading out loud the contents of an email messages. One just needs to right click on the mail and select ‘speak mail message’. Template Usage: One can store a draft mail or archive a copy of the e-mail; which could be later sent easily. It has message protection option for the users who don’t want the mail to get erased accidently which double checks every time the user performs such actions. The content to download can be chosen by selecting from a list of emails queued at the server .This shields user from downloading spam messages. Message Tracing: MailCopa provides a unique feature of tracing email message by listing all the servers it passed through to reach the receiver. Secure MIME: Multipurpose Internet Mail Extension – message data information is signed using public key encryption method and is then delivered to the recipient. Only the user with the key could only unlock the message. This cryptographic method of signing messages makes data more secure. Open (PGP): Pretty Good Privacy is also a cryptographic encryption method for securing the data. It uses first encryption of data using a private key and then decrypts the data on the receiver side using that key. MBOX: MBOX is basically an extension used for holding collection of email message. Using MBOX format we can store our emails using another approach that is creating a file for each mailbox and storing all the messages and information in them in text format. EML: EML is a file format for the emails stored in the MIME format. EML files contain plain ASCII text for headers as well as normal messages. The MBOX files are usually located at user/documents/folders containing email profile name or in the application data. The EML files are usually stored in the user’s documents or the folder named by the user. Check for a foldername.subdirectory i.e. “foldername.sbd” then select Tools then Import option. Check for your file and then select them and Import. Author Bio: seibert is a tech blogger and having interest to do working on various email client applications and conversion procedures. Currently I am working on MBOX format and find a way to convert MBOX files to various formats in simple manner. So, I would like to introduce few effective email conversion applications for MBOX to Outlook conversion which is good in working efficiency.